When customers submit claims they don’t expect perfection, they expect preparedness. Esker helps companies deliver an improved customer experience by enabling CSRs to log, track, manage and prioritise all claims in the same interface as their orders — bringing newfound clarity to issue management workflows. And, with issue-related data available at the click of a button, CSRs always make fact-based decisions which promote continuous improvement and financial savings associated with customer issue management. track & analyse customer issues electronically. 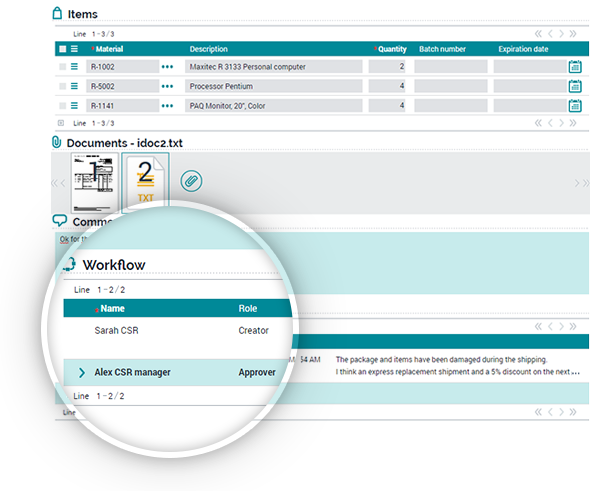 Customise workflow and collaborate freely.